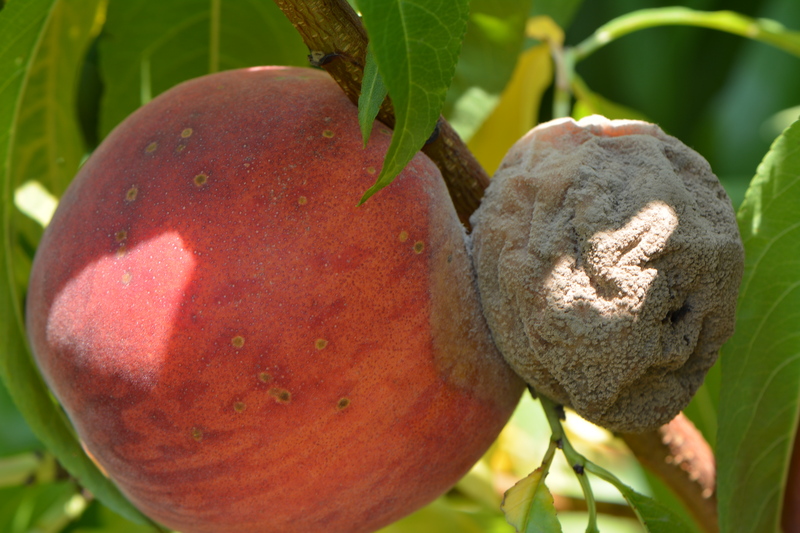 Brown rot of peach and nectarine fruit results from the interaction of many different factors. In Part I of this series, we discussed the various sources of inoculum and their importance for disease development (see July 21 posting). In Part II, we examined the many facets of spray application technology and how they relate to the efficacy of fungicides (see July 24 posting). In this final part III of the article series, we will focus on the various crop-related factors that can influence the infection of fruit by the brown rot pathogen, Monilinia fructicola. As with the fungicide-related factors, growers have control over a variety of plant attributes that influence disease development, such as maintaining an open tree structure. Proper manipulation of these factors can not only directly reduce disease levels, but also enhance the efficacy of other measures, such as improving fungicide coverage. Finally, in part III we will also discuss two more fungicide-related factors, namely biorational fungicides and postharvest fungicide application, as well as the impact of other pests. Cultivar Susceptibility. When examined over a number of years, differences in susceptibility among peach and nectarine cultivars can be observed in the field. However, the level of resistance is never high enough to eliminate the need for cultural and fungicide controls. Nevertheless, those cultivars that historically have higher incidences of fruit rot should certainly be treated as having a higher risk level. Since fruit susceptibility increases with ripening, varieties that have thicker skin, firmer flesh, and resistance to bruising will tend to have less disease development. While these attributes may be worth pursuing, cultivar selection is primarily governed by a number of more important horticultural attributes, such a time of maturation, fruit size, and fruit color. The small level of resistance gained from less susceptible cultivars generally doesn’t warrant their selection over more desirable cultivars. Brown rot on two touching fruit. Close interface between fruit prolongs wetness and prevents fungicide coverage. Fruit Thinning. If a tree has a light fruit load or is lopsided (a few scaffolds have much fruit, other scaffolds with little fruit) then the tendency may be to thin lightly to maintain a sufficient yield. Of course, this approach is understandable from an economic viewpoint. However, care should be taken to separate fruit so that they are not too close or, in the worst case scenario, touching each other. Adjacent fruit that are very close or touching provide the perfect environment for germination of M. fructicola spores. The adjoining fruit surfaces will take longer to dry out and may well be devoid of fungicide since the spray cannot penetrate. If an infection occurs, most likely both fruit will become rotted and provide twice as much inoculum for infecting other fruit. Foliage Density. Very vigorous trees often have many suckers present which creates a dense canopy. The variety ‘Encore’ is a good example. The inner canopy of these trees dry out more slowly, thereby promoting disease development, and the penetration of sprays is curtailed, thereby reducing coverage. Proper pruning at the beginning of the season and perhaps reduced fertilizer usage (or split applications), especially for vigorous cultivars, is important for reducing the risk of fruit rot. Summer Pruning. Summer pruning is defined as a removal or pruning of a portion of the current season growing shoots in early- to mid-summer. Opening the center of trees once or twice during the summer is often accomplished by pruning about half of the shoots with medium to high vigor and completely removing excessively vigorous shoots (water sprouts). This practice provides a number of potential benefits, such as smaller tree size (allows high tree density), reduced overall pruning costs, and more fruit buds in the interior and lower parts of the tree resulting in higher yield and more efficient harvest (D. Ward). One other obvious benefit of summer pruning is a reduction in canopy foliage density. Less foliage and better light penetration translate into quicker drying and reduced length of infection periods. Perhaps most importantly, unlike dormant season pruning, this decrease in density occurs much closer to the harvest time and therefore should have a greater impact on reducing brown rot. Summer pruning should also improve fungicide penetration when it is needed most; it would be particularly beneficial for those using lower spray volumes. Overhead irrigation during the preharvest period can inadvertently create infection periods, thereby increasing development of fruit rot. Irrigation. During the final maturation phase of fruit development, the many cells that formed prior to pit-hardening begin to absorb water and enlarge in size. This process results in a “final swell” that is critical to achieving a large fruit of higher value. Unfortunately, these same physiological changes also make the fruit more susceptible to infection by M. fructicola. Given the need for water during the preharvest period, irrigation is often applied when rainfall is inadequate. Ideally, this water should be applied via micro-sprinklers or drip lines. These methods avoid wetting of fruit and foliage and conserve water. 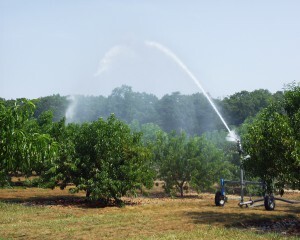 If overhead irrigation is used, then at the very least the application should be performed in the morning to allow adequate time for drying before nightfall. However, since spores can infect tissue within only a few hours, protectant fungicides need to be present prior to irrigation. Free water on the fruit surface, which is required for spore germination, plus increased susceptibility during fruit ripening creates a “perfect storm” for fruit rot development. Organic / Biorational Fungicides. We are continually testing new biofungicides as they become available for management of brown rot blossom blight and fruit rot. So far, none of these products have proven effective enough to be used alone for control of the fruit rot phase in our wet and humid New Jersey climate. Control of blossom blight with biorationals has been more promising, but is also still experimental. If a biofungicide can be found to provide at least a “good” level of control, then it may be possible to deploy it in an integrated program with conventional fungicides. For example, an integrated three-spray preharvest program may consist of conventional / biofungicide / conventional materials in that order. Although this program is not “organic”, it does reduce conventional fungicide usage by 33%. Postharvest Fungicide. Inoculum levels tend to be higher during wet growing seasons and under these circumstances a postharvest fungicide is recommended for application on the packing line, usually in combination with a wax. The reduced-risk fungicide fludioxonil (Scholar 50WP) is currently available for postharvest control of brown rot. Since this fungicide is a different chemistry than any fungicide used in the field, development of cross-resistant pathogens is not a concern. In terms of postharvest disease control, keep in mind that Scholar prevents new infections from occurring while fruit are on the packing line, during handling, or while in storage. If fruit are infected in the field, but harvested before symptoms are visible, rot will eventually become evident during the postharvest period. Scholar cannot “cure” these latently infected fruit, but will help keep uninfected fruit healthy. Bottom line, there’s no substitute for an effective preharvest brown rot control program. 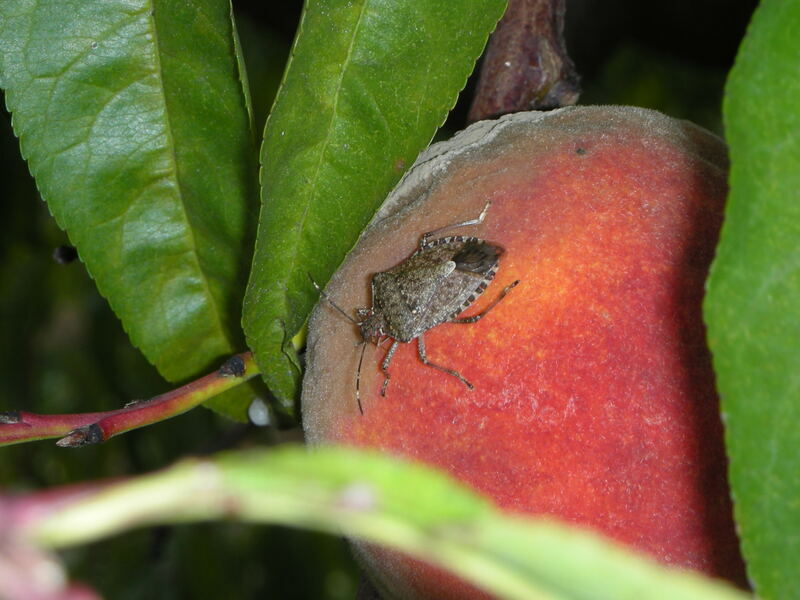 Brown marmorated stink bug on brown rot infected peach. Other pests. Any entity that causes an opening or wound in the fruit, particularly during the preharvest fruit ripening period, provides an infection court for M. fructicola. Hail damage or insect injury can certainly provide these wounds. Thus, proper insect control is critical to obtaining a brown rot free crop. Systemic fungicides can help to limit these infections. Severe peach scab, rusty spot, or bacterial spot infection can result in significant death of epidermal cells on the fruit surface. Such fruit are no doubt unmarketable. However, these necrotic cells will not expand during final swell, resulting in cracks or fissures that allow easy infection by M. fructicola spores. Thus, blocks that may be abandoned because of the severity of other diseases (or insects or hail) can become major sources of brown rot inoculum for the current and subsequent growing season. Conclusion. As should be evident from the three articles in this series of postings, many factors contribute to the severity of the brown rot epidemic in any given growing season. Some of these factors can be controlled or manipulated, while others cannot. And in a wet growing season, paying attention to all these factors is critical to having a successful harvest.